Books Without Words: The Visual Poetry of Elisabetta Gut–OPENS ON FRIDAY! Books Without Words: The Visual Poetry of Elisabetta Gut features twenty-two works by the artist carefully crafted from her dreams, memories, and love for music and poetry. Gut studied at the Art Institute and later, from 1953 to 1956, at the Academy of Fine Arts in Rome. She was given her first solo painting show at the age of twenty-two. But in the 1960s Gut began to search for a new visual language. She was fascinated with the experimental use of materials and the ideas of avant-garde artists. In 1964 she created her first book-object, Diario. From that time on, book-objects, object-poems, and artists’ books that reflect the beauty, sadness, and fragility of life became her favorite media. Gut’s 14 Chiodi (L’impronta di Man Ray) (14 Nails (The Man Ray Footprint)), 1991, was inspired by Man Ray’s famous Gift, 1921, an iron with a row of fourteen nails glued to the flat ironing surface. 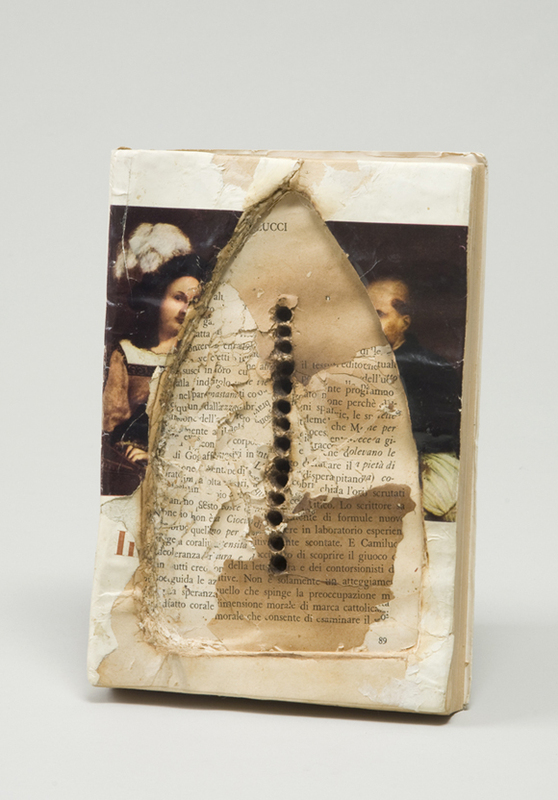 Using an iron, Gut burned the pages of a book and pressed nails into the paper to create fourteen little stigmata, suggesting a “mark” of Man Ray’s original piece. 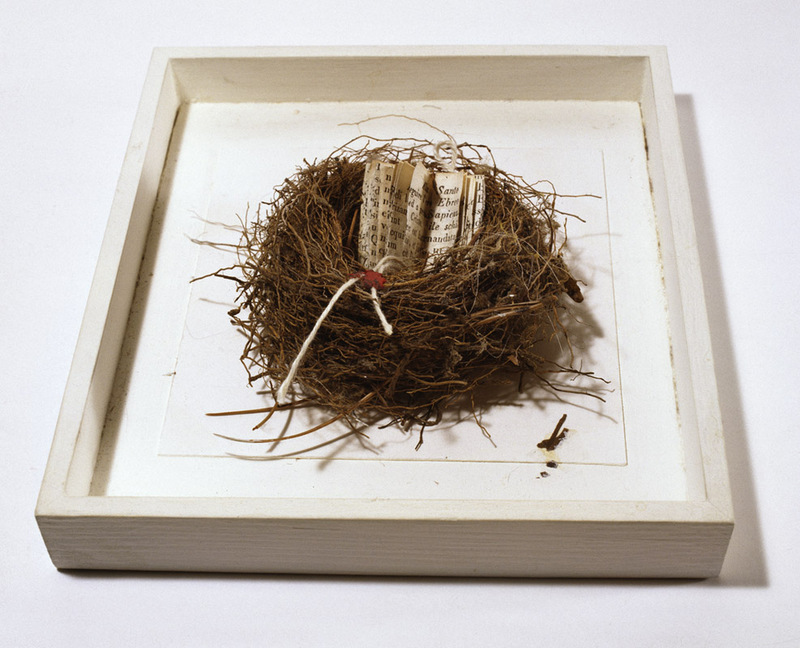 Like Kurt Schwitters and Marcel Duchamp, Gut employed a variety of found materials, including newsprint, photographs, sheet music, threads, leaves, seeds, and shells of exotic fruits. She developed a visual language in which the arrangement of words, images, symbols, signs, and metaphors express in pictorial terms her ideas, secrets, and intimate emotions. Many of Gut’s works are built on the aesthetics of ekphrasis. Ekphrasis describes one form of art interpreted in another medium—poetry depicting a sculpture, for example, or dance portraying a painting. Strumento musicale (p dolce) (Musical Instrument (p dolce))—composed of thread, pieces of sheet music, and dried seeds and leaves collaged into an imaginary instrument—offers peace and solace, while Explosionoire (Explosion), 1985, brings about the rhythm and excitement of jazz through the burst of scattered words and letters. Complementing her love of music is Gut’s passion for poetry. 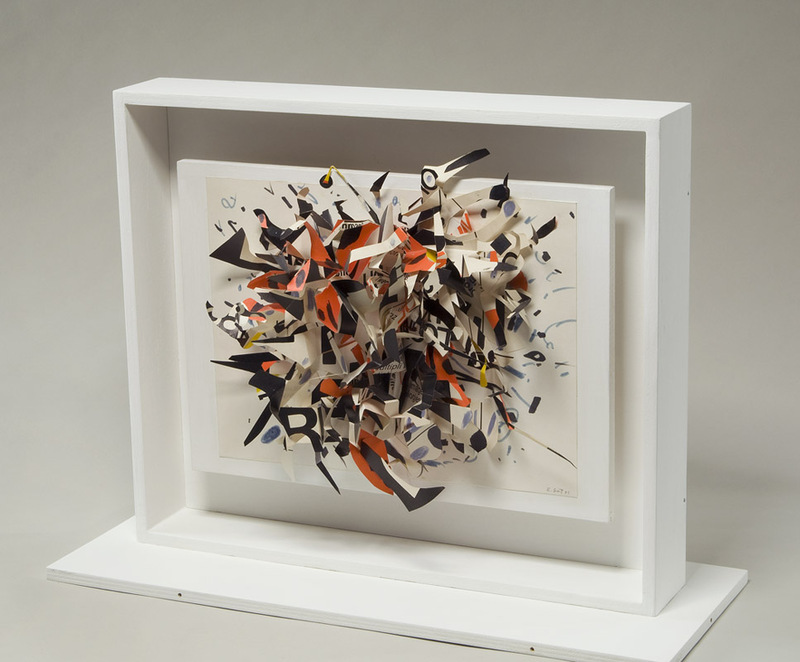 Gut abstracts and transposes works by her favorite poets and composers. L’uccello di fuoco (Da Stravinsky) (The Firebird (From Stravinsky)), 1985, evokes the lightness and plumage of a beautiful bird and animates Igor Stravinsky’s “glorious lava flow of sound.” À Paul Éluard, 1985, embodies the mystery of love, passion, and sensuality—the quintessence of the French poet’s verses—through random dark forms protruding into the air. Gut’s oeuvre represents a mirror of memories, images, and real people. The artist’s messages are universal, conveying love for nature or another person, fascination with music, or a sense of loss. Books Without Words offers viewers reliquaries of poetic thinking to contemplate and behold. –Krystyna Wasserman is curator of book arts at the National Museum of Women in the Arts. Books Without Words: The Visual Poetry of Elisabetta Gut is organized by NMWA and made possible by the generous support of Margaret M. Johnston. This exhibit looks very interesting. i am in Florida and unable to attend, but my sister is planning to attend.She lives just ouside Washinton DC. I am wishing you well wishes for the exhibit. Well wishes from an interested woman in Florida. I am unable to get to DC at this time, but my sister is going to the exhibit.